The spot on the web for craft ideas!
? This great DIY psychedelic painting is going to be just the trick! The best part about it is that it’s pretty much impossible to get this wrong, making it an awesome art project for kids as well as adults. Optional: Wide masking or duct tape. A location where you can safely make a mess! Superglue the crayons to the canvas in whatever order you desire (rainbow arrangement is a good way to go, in fact many times crayons come pre-arranged in this order in the package so all you’ll need to do is transfer them from the package to the canvas). Tilting the canvas at a slight angle, begin blow-drying the canvas directly behind the crayons (by not blow drying them directly you’ll encourage a more even drip). As the crayons begin to melt, ensure that you are continuously blow drying the full canvas where the wax is melting, as it cools and dries very quickly. 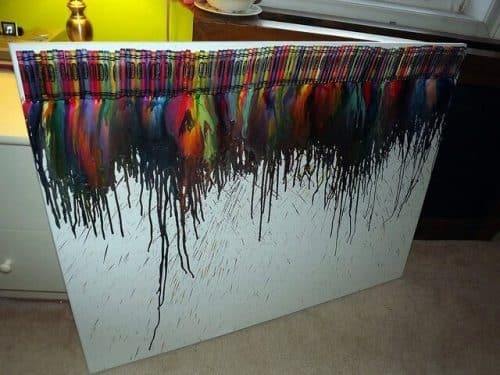 Keeping the entire canvas warm will allow the crayons to spread and cover more area. Let the crayons cool off and voila! If you’ve taken the extra step of creating tape cutouts, now is a good time to go ahead and peel them off. This will leave you with fun shapes amid the kaleidoscope of color. Handmade Earrings Are Cool and They Make You Look Hot! Interested in new original craft ideas? Then this crafty corner is the right place for you. Craft Corners is like a little workshop with corners for stitching, handmade jewelry, recycled crafts and ideas for home & garden or your art and design projects. We also like to help you prepare unique decoration for special events such as birthday, wedding or other family celebrations. Anything made of fabric, wood, plastic, glass, metal can be turned into something amazing. Our team is a bunch of craft loving do-it-yourselfers who like to come up with their own creations. We happily welcome guest bloggers to write about their favorite crafts. We are looking forward to your suggestions and comments!